An ethnomusicology graduate, Rajan was in tenth grade when he first set foot in a recording studio. It was the first day of school, he reminisces. Eight years later, he would work in the same studio: Vinapa Records. “In fact, I got my first taste of Pro Tools and even its precursor Sound Designer II there. 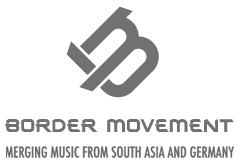 I grew up in Kathmandu listening to Nepali film music, Aadhunik music and in the later years guitar based ‘village-pop’. It was not until my ninth grade that I started listening to Western music. It was around the same time when the kids got full access to the tape player in the house. We listened to the regulars: Guns n Roses, Metallica, Black Sabbath, Deep Purple and then transitioned into Jimi Hendrix, Cream, Stevie Ray Vaughan. There was a lot of blues in the formative years apart from The Beatles and The Grateful Dead,” said the artist. There’s a certain unlikeliness to Rajan’s sounds; a strident tumult that sweeps through layers of emotions. In some melodic passages where voices, whispers and laughter burst into rhythmic motives and soft tone clusters, amidst nostalgia emerge moments that seem forlorn, and fade into nothingness. “There is a loneliness that can be rocked. Then there is a loneliness that roams. No rocking can hold it down. It is alive, on its own”, wrote Toni Morrison in ‘Beloved’. Sometimes, in short flourishes, one discovers such melancholic refrains in Rajan’s music. “I cannot think of a particular point in life where I decided to be a musician or recording artist. It was not by choice but a natural progression of things, I guess,” says the artist who also produces music under the moniker Phatcowlee. As the bassist/co-producer of Jindabaad, a post-rock band, the artist also dabbles with interactive art involving audience participation. 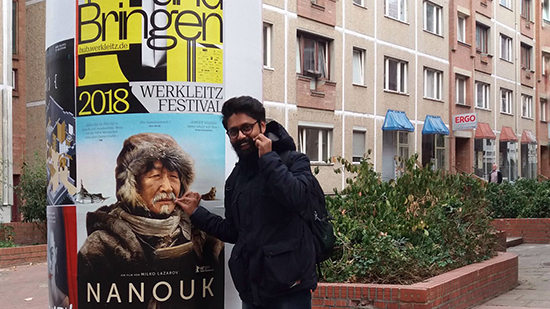 In the first week of his trip to Berlin, Rajan spent some time with Night — a new-school folk band from Nepal — who were on the last leg of their European tour. With a folk inspired repertoire of compositions, the band has over the years procured and mastered the nuances of playing a vast range of traditional instruments including tungna fretless lute, mahali reed trumpet and the original shepherd’s instrument, the paluwa and a fresh young leaf used as a reed held between fingers. “It was such a humbling experience to hang out and jam with them. I did not perform in Berlin except for the gig with Night and Knox Chandler which was not a part of the programme. The main show, as part of the residency, was In Halle (Saale) — a two-hour train ride from Berlin. It was for the opening of WerkLeitz Festival – a multimedia art exhibition. I played alongside Andreas Spechtl and Electric Indigo (of female:pressure fame). 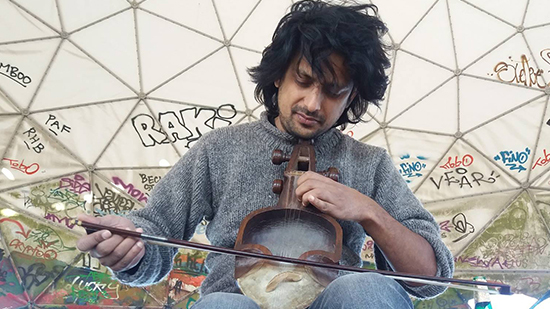 I also flew to Budapest and played an improvised DJ set in what used to be an underground radio station called TILOS,” says Rajan who also spent some time with Ranav Adhikari, an ethnomusicologist who went to Berlin five years ago to study visual anthropology, “He sings and tours with a band named Juga now. He also took me to the abandoned CIA building and its domes where we recorded some experiments with Sarangi. Also, I met Pablo Lauf who is not a trained musician in any traditional sense. I was surprised at the ease with which music flowed out of us during our jam sessions.” Despite playing in different bands for the last eighteen years, Rajan finds collaborations incredibly difficult. For, there are very few people, he says, that he could communicate his ideas through music. “I was comfortable doing that with Pablo. He and I found good friends in each other. So, we ended up sharing stories with each other and eventually had long jam sessions in his home studio. Ideas became music organically which is a rarity to find if you’re coming from different backgrounds both musically and culturally,” he explains. Amongst the collaborations that Rajan has partaken in over the years, Fuzzscape — a multimedia project where a team of creative professionals travel to explore the cultural and social identity of Nepal and collaborate with artists from within the communities — deserves a noteworthy mention. They develop work and create art inspired by their interaction with the people, the space, and its culture. They even facilitated workshops highlighting intangible heritage, issues surrounding it and its conservation through multiple art forms. 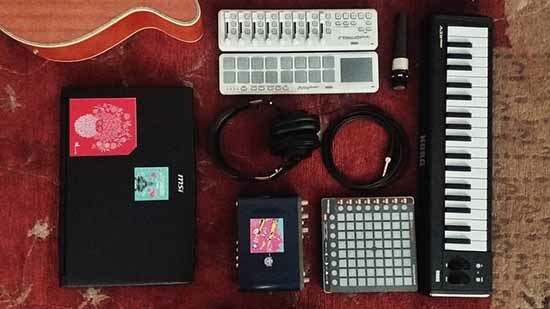 For Rajan, sounds don’t merely coalesce to form music. In his compositions, there’s an intuitive musical unit that strives to mould structures from melodic layers. His dynamic sound territory extends from cinematic to soft thematic patterns. Sometimes, there’s a memory. Sometimes, there’s an emotion. “A variety of moonbirds, I commune with them as they do with me,” wrote Laxmi Prasad Devkota in ‘The Lunatic’, “In such a language, friend, as is never written, nor ever printed, nor ever spoken…” Rajan’s language may have changed, his medium of expression altered over the years. For, he was never adherent to convention. What has remained consistent, however, is what defines his artistic identity today — honesty.